Energy Efficiency... Embee Takes One Step Ahead!!! More than 6 decades of experience with continuous research, technical modernization, co-operation of our technical team enables us to offer unique textile machinery products of high quality and precision. Today, Embee provides a complete range of rotary printing solutions. Innovation has been not only core strength but also a tradition at Embee. Embee group’s vision is to be the most trusted global leader in innovative technological solutions which are focused on Higher Efficiency and Returns for sustainable growth of all the stakeholders. Embee’s all machines are aligned with its vision. While investing on capital machinery, capital cost and running cost should be equally considered. Embee has designed a dryer which has lowest energy consumption in the market. 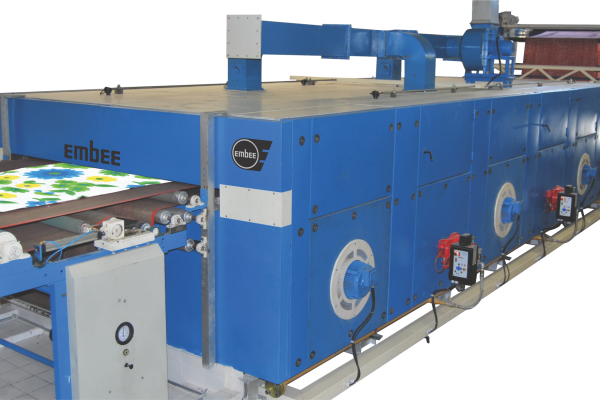 As a result, Embee has received an overwhelming response and a lot of customers have replaced their current dryer of European rotary printing machine with Embee’s dryer. We have sold our dryer to not only in India but in Bangladesh and Turkey also. Fast and optimum drying efficiency possible due to unique dryer design with 3 chamber dryer having 12 radiators, coupled with special airflow system for maximum heat efficiency and air circulation inside the chambers. Different heating options available (Gas/ Thermic Oil/ Steam) as per customer’s choice. Highly efficient temperature control with inverter system. Specially designed nozzles for easy and fast cleaning for maximum energy efficiency. For longer life of the dryer, heat resistant paint used. Complete machine structure powder coated for longer durability of the machine. Embee’s innovative radiators enable faster drying and low energy consumption. High quality insulation used for minimum heat loss and energy efficiency. Compact dryer with low volume leads to further low energy consumption. Low height design of the dryer is suitable for rising it higher to free the floor space, hence space saving. Suitable for drying all types of fabrics.